The story of the Cowboys offseason is the recent suspension of star running back Ezekiel Elliott. That suspension is another topic for another day. Assuming the suspension is upheld (I expect a reduction from six games to four) the Cowboys win total will suffer somewhat. There is enough offensive talent to sustain even a tough early schedule however. Darren McFadden is a capable backup and that offensive line should get the job done. Dak Prescott has looked sharp in preseason and a healthy Dez Bryant and emergence of Bryce Butler will have this passing game on point. The key to the Cowboys is the emergence of a revamped defense. Jaylon Smith seems okay following a redshirted rookie season from that tough knee injury and along with first round pick Taco Charlton the Cowboys should get much needed pass rush. The secondary has also been revamped; second and third round corners Chidobe Awuzie and Jourdan Lewis respectively will play key roles. Free agent addition Nolan Carroll II needs to be professional as a starting corner, and third year safety Byron Jones has to develop into the breakout star expected. 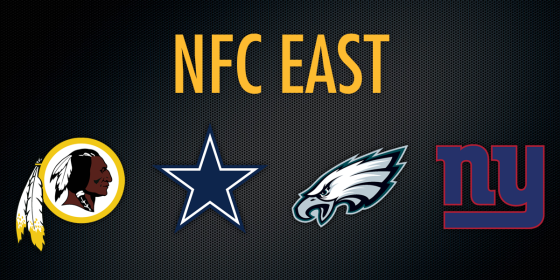 All NFC East teams play the tough AFC West so expect lower win totals for each team. The Giants simply have not looked good offensively this preseason and because of that I can’t give them the division. The offensive line is not creating holes and the running game doesn’t appear to be good enough even with the improvement of Paul Perkins. Brandon Marshall along with rookie Evan Engram will make the passing game difficult to defend alongside star Odell Beckham Jr. The defensive is spectacular on all three levels but the secondary is likely the best in the league. Landon Collins is a Defensive Player of the Year candidate at safety and Janoris Jenkins and Dominque Rodgers-Cromartie are excellent corners. Look for last years first round pick Eli Apple to continue to progress. Damon Harrison will continue to be a force up the middle on the defensive line and Oliver Vernon was much stronger than I expected last season. If the offense comes on at any point (even late) this season you could see the Giants pull off one of there Super Bowl runs where they sneak into the playoffs and are hot, but they haven’t gotten it together for me to expect that at this time. The Eagles are a very interesting team especially following the training camp acquisition of emerging corner Ronald Darby from Buffalo. Darby compliments a defense that has star safety Malcolm Jenkins as well as 2X All-Pro Fletcher Cox at defensive tackle. Offensively the Eagles boast a solid offensive line. Even at 35, Jason Peters is still a top end tackle and Lane Johnson has come into his own (as long as he can stay healthy). Second year quarterback Carson Wentz will continue his strong play and all indications are he will be a solid player in this league for years to come. I worry about how much a 30-year-old LeGarrette Blount has left to continue his physical running. If he can keep that pace up, this is a dangerous offensive team. The division is wide open so the Eagles have a shot, the difficult NFC East schedule maybe too much for this young team right now however. Despite back-to-back winning seasons for the Redskins, I expect a drop off coming into this season. Kirk Cousins has been franchised for a second straight year but I don’t expect that to be a distraction and his numbers should be solid again but will suffer with the departure of DeSean Jackson. Jamison Crowder will look to fill that role and expect if tight end Jordan Reed is healthy that he will continue to be a problem for opposing defenses. The line still has Trent Williams at left tackle and Brandon Scherff is coming into his own. The defense is still the question with this team. Josh Norman has still been top end since coming to Washington and Ryan Kerrigan is an elite pass rusher. Mason Foster is a solid linebacker so the defense is okay on all three levels, but I don’t see enough there with this division and schedule. All teams have at least a shot at this division but I still have Washington coming in last. The departure of DeSean Jackson will slow the offense down enough they won’t be able to erase defensive issues.